Never mind what the media pundits say about the Iowa caucuses. Hillary Clinton should announce her presidential campaign here. That’s what Michelle Bernard, head of a Washington, D.C., think tank on women and politics, told an audience at Iowa State University this week. Bernard, an author and regular commentator on MSNBC, was the Mary Louise Smith Chair in Women and Politics. After taking a red-eye from San Francisco and enduring flight delays, Bernard arrived without her luggage and got her first taste of “Iowa nice.” The hotel shuttle driver, hearing she had a speaking engagement but no luggage, took a look at her sweatpants and “massive, major afro” from flying overnight. “You’re pretty, but you really cannot go there looking like that,” the driver told her. The driver took her to the mall and introduced her to Younkers. “I told the salesperson what was going on and she felt sorry for me. So the dress I am wearing is brand-new … I got it for 75 percent off plus two coupons. So I got my dress for $20,” Bernard said. Most of us could only wish we looked that good in a dress costing 10 times that much. Iowa was nice to Bernard, so she returned the favor, pushing back at critics of the Iowa caucuses. So should Clinton take Bernard’s advice and kick off her presidential campaign here? Iowa wasn’t so nice to Clinton in 2008, when she came in third in the caucuses to Barack Obama and John Edwards. Assuming she runs for president, it’s still an open question what sort of campaign she will run in Iowa. She can run a robust campaign here regardless of where she makes her announcement, of course. But if Clinton were to launch her White House bid in Iowa, it would make a statement in more ways than one. Iowa surprised the nation when Democrats made Barack Obama their choice for president over Clinton, who had been the national frontrunner and expected nominee before 2008. 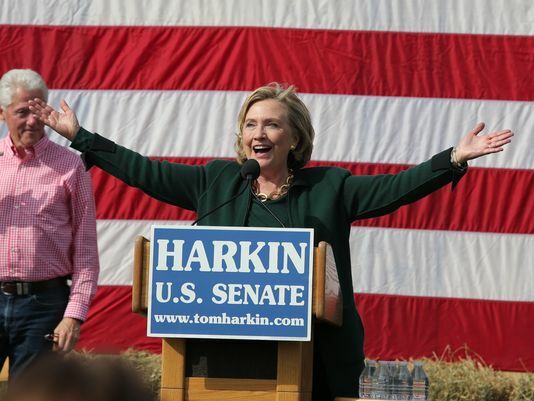 Some say Clinton has something to prove in Iowa in 2016 about her ability to connect with voters and deal with the concerns of the progressive wing of the party. Right now, that doesn’t seem like such a high bar. Clinton overwhelmingly leads polls of likely Democratic caucusgoers in Iowa. She’s stronger here than she was at this point in 2007, when she faced a much stronger field of potential rivals. And yet Clinton can’t afford to give the impression she’s taking anything for granted. Launching her campaign in Iowa and playing here as if the state were competitive — even if it’s not — could help her silence those criticisms. If Clinton runs for president, it won’t be merely to become the first woman in the Oval Office. But for a candidate whose victory would make history, Iowa is a fine place to start. That’s an even better deal than a $20 dress and two coupons for Younkers.